Boilsoft Video Splitter for Windows 10 - video editor for fragmenting clips. The application supports most types of video data, allows for separation operations in manual and automatic mode, includes frame-by-frame editing tools. The utility is able to delete the specified frames after a certain period of time or a specified interval, can work in batch mode and convert ready-made objects using built-in codecs. The video editor contains a preview player and has a high rendering speed due to the use of computer hardware. 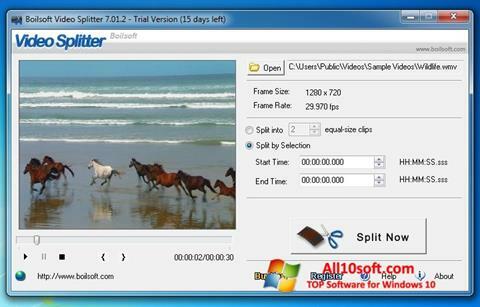 You can free download Boilsoft Video Splitter official latest version for Windows 10 in English.